For the first hour or so, Demonwarp is pretty standard slasher film. The killer just happens to be Bigfoot this time. 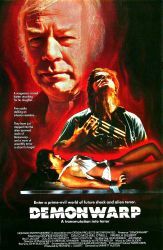 It revels in being gruesome and comes across as a slightly higher budgeted Night of the Demon (1980). Without much warning zombies, aliens, and satanic rituals are thrown into the mix resulting in a confusing mess of a third act, but a memorable one. All of these revelations are played with the same exacting grimness of the earlier Bigfoot attacks, so it holds together as a narrative better than it should. It’s definitely not enough to make up for the by-the-numbers horror of the first hour, but I appreciate any attempt to create something new from all these standard elements of horror.